2) stay in left lane and pick up signs for Rt. 12 S Hatteras Island/ Ocracoke. Please call for current tour details. Pricing is subject to change. All prices are per person. Length of tours includes on land lesson and doesn't account for driving time to tour location. Contact us for discount rates and specialty group pricing. YOUTH GROUPS and RELIGIOUS GROUPS should email or call for special pricing consideration. Select a Kayak Tour and/or a Stand Up Paddle Tour and Register Online by selecting a Tour from Our Tour Calendar. To make a reservation online for the next morning, the deadline is 9:00 PM. 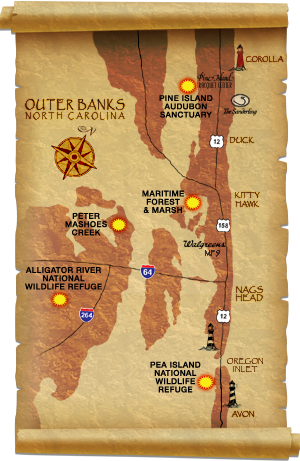 The cut off for booking an afternoon tour to the Alligator River is noon and all other tours is 2:00 PM. You may also call us anytime for last minute reservations at 252-441-3393. If you like a face to face interaction, you can visit us at our main reservation office at The Waterfront Shops in Duck. Cancellations must be made at least 48 hours before the departure time of your tour to avoid being charged. If circumstances beyond our control cause a trip to be canceled, full refunds will be issued or you can reschedule your tour. No-shows will be charged the full ticket price. Get Our Latest News & Specials!